During the period of absolute monarchy, from Bangkok's founding in 1782 until the revolution of 1932, more than 100 palaces were built in and around Bangkok to house the royal family and its offspring. Only a few of these are still used as royal residences. Many were seized or given to the government following the revolution, some passed into private hands, while unfortunately many more have been torn down. Only a very few palaces are open to the public. The most notable exception is Vimanmek Mansion in the old Dusit Palace grounds. The list here covers in chronological order the palaces that you can visit to some degree, or at least those you're likely to see in passing on a visit to Bangkok. 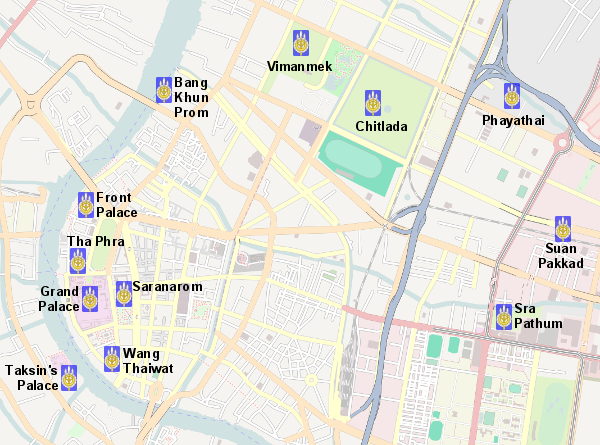 After the fall of Ayutthaya, but before the founding of Bangkok, King Taksin made Thonburi on the west bank of the Chaophraya River the capital. He built a palace next to Wat Arun. Today the palace is part of the headquarters of the Royal Thai Navy and although well preserved, it is rarely open to western visitors. The Grand Palace was one of the first buildings constructed by King Rama I upon establishing a new capital at Bangkok. Construction began in May of 1782 and was initially completed in June. However, this was only a temporary structure which was soon replaced by masonry the following year. In the Thai system of monarchy, the king traditionally appointed a viceroy or deputy king, who commanded the vanguard in times of war and assisted the king in the civil administration of the country. The deputy king, or Uparaja in Thai, was also the designated successor of the king. Naturally, such an important person needs his own palace, which must be second only to the king's in grandeur. The Front Palace, or Wang Na, was where the Uparaja lived. The palace was built at the same time as the Grand Palace, but when the post of Uparaja was eliminated by King Rama IV, his successor turned the palace into the National Museum. Tha Phra Palace was built next to the Grand Palace for a nephew of King Rama I. It was occupied by a succession of princes through to Rama V's reign, after which it was incorporated into the campus of Silpakorn University, where it now serves as the art museum. In 1832, after a fire destroyed many palaces and buildings in the area, Prince Phithakthewet, the 22nd son of King Rama II, built Bahn Moh palace in the area. The Prince was in charge of the Cavalry Department under Rama III, and later also the Elephant Department under Rama IV. This palace was built by Rama IV in 1866. He planned to use it after he abdicated but he died before it was completed. Rama V gave the palace to his sons, including the crown prince, who stayed there before becoming king. Later, the palace was used to house high ranking foreign visitors. After returning from a trip to Europe in 1897, King Rama V determined to build a new royal palace in Bangkok, in part because he was greatly impressed by the palaces of Europe, and also in part because the Grand Palace had grown so crowded that it became unbearably hot in the summer. The king purchased some farmland north of the city and commissioned the Dusit Palace, which was completed in 1900. In addition to the Dusit Palace, the prodigious King Chulalongkorn (Rama V) also ordered the construction of Bang Khun Phrom Palace on the riverfront around the turn of the twentieth century. In addition to the palace building, he also ordered the construction of the "Newlyweds Mansion" (Tamnak Haw) in 1903 for the just-married Prince Paribatra. The Tamnak Haw has since be relocated to the grounds of the Dusit Palace. The palace is now bart of the Bank of Thailand, and the palace building houses the bank's museum. Its hard to believe now, but when it was built in 1909, Phayathai Palace was a 'country' cottage where King Rama V (Chulalongkorn) and Queen Saowabha could escape on the weekends and relax 'down on the farm.' The small palace was indeed a farm where the king and queen conducted agricultural experiments -- something the current king still practices at Chitlada Palace as well. The land on which this palace sits was given to The Prince of Songkhla (Mahidol), the father of the current king, early in the twentieth century. He was away studying overseas at the time, and the palace was not built until the 1920s. Unfortunately, he did not have time to enjoy it for long, as he died in 1929. The Chitlada Palace next to the Dusit Zoo is the current residence of the King. It was constructed by Rama VI early in the twentieth century. It is always closed to the public. There are other 'palaces' in Bangkok that were built by or for minor royals outside of the Chakri Family. Some of these are open to the public, or at least quite visible. At the busy intersection which more or less forms the bottom tip of Ratanakosin Island stands the former palace of Wang Thaiwat Prachachetuphon. The palace was built by Rama III (1824 - 1851) for some minor royals. This collection of traditional Thai houses was brought together by Prince and Princess Chumbhot in 1952. Some of the houses belonged to the prince's family and all are more than a century old. The buildings and the collections became a museum on their death.